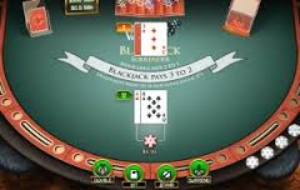 Online blackjack casinos offer another version of Blackjack called ‘Blackjack Surrender’. This is a great alternative to playing original blackjack. There are two ways of playing this game; an ‘Early Surrender’ and a ‘Late Surrender’. The Early Surrender will take effect after the cards have been dealt but in advance of the dealer looking at his or her cards. The Late Surrender will occur after the dealer has look at his or her cards to acknowledge whether a Blackjack hand has been dealt. A lot of casinos only let you perform a late surrender. In both of these surrenders the dealer will remove your cards, along with half of your original bet. The basic meaning of surrender is when you immediately surrender your hand and gain half of your bet back, you have to do this before you take a ‘hit’, as after this you are not allowed to surrender and will have to play the hand. The surrenders in blackjack can be a very advantageous move if you have used it in the correct situation. The smart and experienced blackjack player will usually always take advantage of the surrendering opportunities. Here is an example of why you can surrender to your own advantage; Your hand value is at a loss of more than 50% of your bet, this is when you should surrender so that you can take back half of your bet rather than playing out the round and losing your full bet. This type of blackjack is normally only allowed on games that use 4, 6, or 8 decks of cards. With knowledge of how and when to surrender, you can help to reduce the house’s edge. A general rule when surrendering in Blackjack is to never surrender against the dealer who is showing an 2 to 7, this should only be considered when the dealer reveals an 8, 9, 10 or an ace. A ‘hard’ hand is a hand that has no aces or a hand with an ace which can only be counted as 1 point and not 11 points. A ‘soft’ hand is a hand with at least one ace which can count as 11 points or even 1 point. Following is some examples of when early surrenders should be taken against a dealer with a 10 or an Ace; a dealer’s Ace against a hard 5- 7, a dealer’s Ace against a hard 12-17, a dealers’ ace against a pair of 3’s, 6’s, 7’s or 8’s, a dealers 10 against a hard 14- 16 and a dealers 10 against a pair of 7’s or 8’s. Exceptions of these rules are; in a single deck do not surrender a 10 versus a 4+10 or 5+9, in a double deck, do not surrender a 10 versus 4+10, and do surrender the dealers ace against a pair of 2’s if he or she hits a soft 17. Online blackjack surrender players need to be aware that the entire deck is shuffled before each game begins. If your hand consists of a 5, 6, 7, or an 8, you should never surrender and always take the next hit.